It’s the school holidays, and this means I’ve actually got time to a) read b) blog about what I’m reading. I’ve been flying through books like nobody’s business and I’ve picked the good, the bad and the brilliant to tell you about! Of late I have been making a concerted effort to read more books from outside of my cultural comfort zone (i.e. not British, and not pre 1950) and a new colleague is a huge fan of Adichie, so I duly borrowed Americanah from the library for some holiday reading. It’s the story of Ifemelu, an ambitious young Nigerian woman, her high school boyfriend Obinze, and their contrasting young adulthoods as they both attempt to escape Lagos for the promised land of America. Ifemelu goes to study in America, and finds herself suddenly exposed to her race and how it identifies and defines her in the eyes of others in a way she never experienced in Nigeria. While she struggles to find work and to make ends meet, she also struggles to assimilate to a new culture where she is, perplexingly, considered lesser than everyone else around her. The shock of this is enough to send her into a deep depression, during which she shuts Obinze out completely. Once recovered, she starts a successful, controversial blog, about race in America, dates American men, and finds herself moving far away from her Nigerian self. Obinze, meanwhile, never makes it to America, and finds himself sleeping on a friend’s sofa in London instead, working in menial, low paid jobs under a false name, unable to get the visa he needs to be there legitimately. He is forced to return to Lagos, where he becomes highly successful, but at the heart of his sanitised existence in a luxurious suburban compound, there is something essential missing. When Ifemelu returns to Lagos after years in America, will she be able to readjust after so long in another culture? And can she and Obinze ever reconnect, after so many years living completely different lives? I loved the structure of the novel – it goes forward and backwards in time, and in and out of different characters’ experiences, allowing for a gradual unfolding of their lives and how they end up where they do. The characters were wonderfully realised; I felt like I knew Ifemelu and Obinze intimately, and was so invested in them and their fate. Adichie’s observations on the cultural behaviours and expectations in all three countries were incredibly thought provoking and I particularly enjoyed the extracts from Ifemelu’s blog, which raised points about race I’d never thought about before, and made me feel incredibly ignorant. I was utterly immersed in the story, and emerged from it feeling emotionally moved while also being incredibly challenged. I am now very much wanting to read more by Adichie and other contemporary African writers; recommendations would be welcome. The use of the onomatopoeic ‘scratching’ here is already sufficient to produce an auditory response in the reader; we can imagine the bristles of the brush making the harsh sound the word creates for us as we say the word in our heads. The random addition of ‘like mice in a cupboard’ adds nothing to this impression that has already been created, and instead just functions as a pointless and distracting addition to the sentence. One minute I’m imagining the scene the author is actually trying to depict – someone cleaning the floor – the next, I’m suddenly asked to imagine mice running in a cupboard. Why? These sounds and images bear no relation to one another. Why is this considered to be good writing? If one of my students had written this, I would have crossed out the entire simile and given them a good talking-to. ‘The wooden hulls clacked against each other like oyster shells in a bucket’…’I was black as a fly in butter’…’I felt watched as a clock’….’London air, wet as a kiss’…’his new black coat stretched tight as a cheek’…all of these examples are within the same two hundred word section. Utterly pointless simile after simile. I could go on and on. I’m sure for some people this kind of writing is very atmospheric and wonderful but because I am a shameless pedant, I’m afraid I just can’t get on with it. All the Amazon reviewers seem to disagree with me, however, so I am clearly in a grumpy minority! I’m sure everyone apart from me has already read this, but it was a new discovery for me after spotting it on a recommendation table in Waterstones, and in my desire to read outside of my cultural comfort zone (as explained above), I snapped it up. The fictionalised true story of a middle aged couple’s resistance to the Nazi regime in wartime Berlin, this is a truly remarkable novel about the human cost of hatred and paranoia. This is both a damning indictment of the Nazis and of those who used their regime to fulfil their own pathetic desires to wield power over and cause suffering to others – and a wonderful affirmation of the essential goodness of the majority of humanity, and the lasting ability to love, to help, to protect and to fight against injustice, even in the face of fear and horror and hatred. 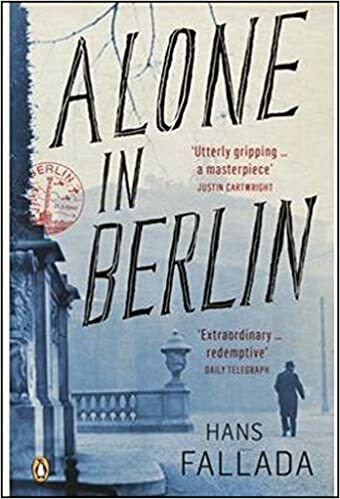 I have never read a novel set in Berlin during WWII, and it was fascinating and horrifying for me in equal measure to understand more about what it was actually like for people living there at the time. I was moved to tears by the bravery of many of the characters, and by the needless suffering so many of them had to endure. I am so grateful that Michael Hofmann, the translator, made it possible for me to read this beautiful book. If you haven’t read it, you must. I too loved Americanah and cannot abide simile-laden prose. Alone in Berlin sounds fascinating so I will look out for that one. I hope you’ll enjoy Alone in Berlin, Liz. It really is a wonderful book. Karen, what an amazing job to have done! I must confess I have always avoided books about the Holocaust because I find it so upsetting but I would like to read more books set in Germany during the period. If you have any recommendations, I’d love to hear them. I hope you’ll give Americanah a go! I’ve got Half of a Yellow Sun lined up to read next, Col – I’m really looking forward to it! Yes, I loved the hairdresser sections too. How lucky that you got to hear her speak! I hope I’ll have the chance at some point. Please do give Alone in Berlin a go – it really is a brilliant book. I also hate writing that has pointless figurative language. I read Americanah a few years ago and enjoyed it. I’ve just added Alone in Berlin to my list. I’m glad I’m not the only one, Aileen! I hope you’ll be able to get around to Alone in Berlin soon. It really is a fantastic read. Fascinating ideas. Just a suggestion about language: you can’t make a “concerted effort” by yourself. By definition, it’s the effort of a group. You may have meant a “concentrated effort”. Clearly I’m not the only pedant around here, Brooke! 😉 Thanks for pointing out my mistake! Although I liked Americanah, I enjoyed ‘No longer at Ease’ by Chinua Achebe much more. Although the third in a series of novels about different generations of a family, it can be read as a stand alone novel. It is about a young man torn between cultures in the 1950s as the British prepare to leave Nigeria. I would certainly recommend this if you want to read more African literature. I much prefer novels from previous times. Modern writers can be excellent but I find many of the modern novels need tighter editing. The abundant similes would drive me nuts. The other books you mention sound wonderful. I’ve not read Americanah, but enjoyed Alone in Berlin very much. As for Frannie Langton – no thank you! Like mice in a cupboard, like oysters in a bucket…if that’s the kind of c..p that gets published by Penguin nowadays, it beggars belief. Flaubert, please, come back ! There’s a beautiful Everyman’s Library edition of Chinua Achebe’s The African Trilogy. I hate the use of similies in prose. I have cushion cover envy from your image! I do agree about Creative Writing by Numbers – they all read as if they’ve done the same bloody module! But have you read A Woman in Berlin? Non-fiction, published anonymously although the author’s name – which escapes me for the moment – was later revealed. I think you’d find it fascinating, an episode of the immediate post-war era which has been completely airbrushed. Lovely post! I enjoyed reading Americanah. I’ll put Alone in Berlin on my list. Thanks!